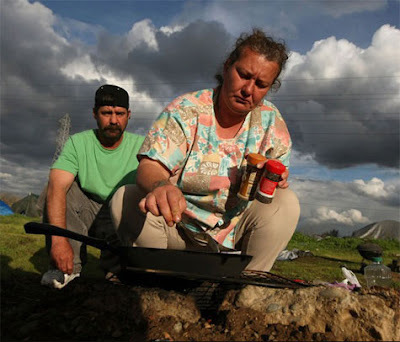 Tammy Day, seen with her husband Keith, cooks over a campfire at the homeless encampment. Nice (if a bit depressing) photo gallery by Getty photographer Justin Sullivan of Sacramento's tent city. Officials hope to close and relocate the current encampment in the next month. What's for dinner...and photo reproduction rights. I really would like to see real people on tv, instead of 'reality tv'...and notice this woman holding spices, and clouds heavy with moisture in the sky, getting ready to cry. I bet her husband caught dinner that evening. Nice quiet grey, with colour and word unfolding...and not all glittery...closer to what Mother Nature intended. Then I thought, gosh, don't these people know that if they just did something 'wrong' they'd end up all cozy and warm in some 'cell' with free healthcare and a bed...not to mention getting fed.